I am a long time fan of Agave, but if Agave is the vi of the color pickers... there has to be an Emacs of it. And it is gpick, which as opposed to the lean Agave, provides a lot of additional functionality. Needed, unneeded functionality? I guess this is about the users, some will like one, some will like the other. But gpicker is available in no Fedora repository so far and many won't bother with a manual build (then what would be the purpose of the distro? ), so is not that easy for a Fedora user to play with it. Or it is? A former Fedora contributor, now in SUSE land, provided a F14 package (in a handy repo), so the curios has access to the toy (the SUSE build system seems useful after all). I like it because I can design a color scheme there and export a gimp color palette to use in Inkscape (or Gimp of course). @Richard: that web app is cute and seems useful, i still prefer a stand alone app, which can be used offline and which i know is Free software. 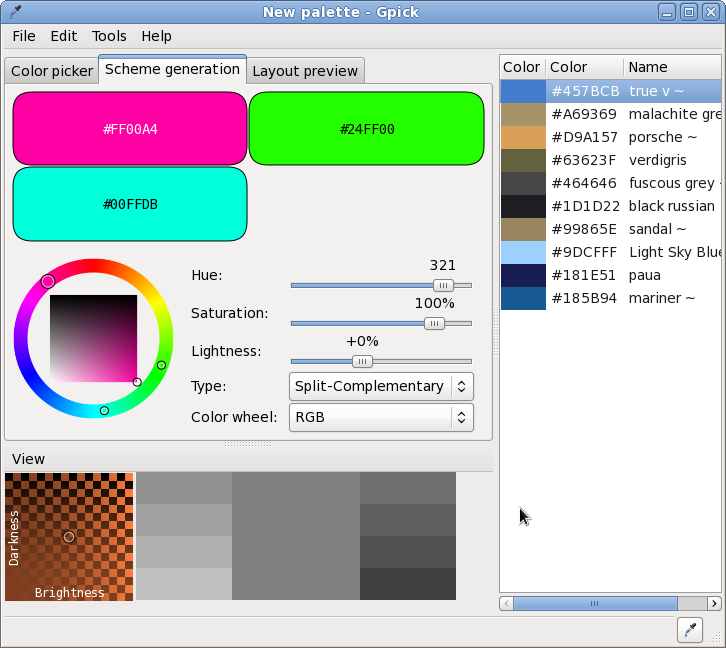 AFAIK, all those apps (Agave, gpick, the web app) can export as GIMP palettes. "But gpicker is available in no Fedora repository so far and many won't bother with a manual build (then what would be the purpose of the distro?)" nicu - yes, I'm not sure it's Free Software. Version 2 of the tool was CC licensed, but I can't seem to see if Version 3 is. I have the same opinion like Nicu, I dont like the online tools. Like more a standalone tool on my machine. But for me Agave has not the quality of vi. I searched long time for such an tool. I compared Agave with KColoedit, the last one is better in functionality, but is a little bit cryptic with the GUI, so I liked Agave more. But Agave cant give the palette a name, so you have to do it with an editor after saving the palette not so useful.